﻿﻿What a weekend! Despite still recovering from the bubonic plague, or a sinus infection and bronchitis, I was able to get out of the house on Saturday to attend a cooking class at The Chubby Cook in Beachwood. I'm a reformed microwave gourmet, and I love learning new cooking tips and techniques. 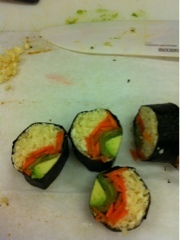 Raw sushi that I rolled myself - look what I can do! 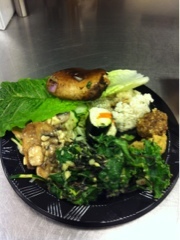 In addition to the sushi, we made a whole bunch of other raw dishes - everything from zucchini pasta with a raw mushroom sauce, to mushroom "steaks", to kale salad, and mali kofta. That sushi sounds really good! I just recently discovered kale salad and LOVE it. My recipe is guest posted on Clue Into Cleveland (@adhicken) and on my blog if you are interested. 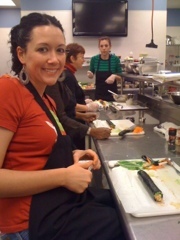 I love the Chubby Cook and am hoping to attend a class there one of these days as well.